Tyler Foy pitches during Eastfield’s 15-8 road win over Richland April 22, earning him his second win of the season. Photo by Lesley Reyes/The Et Cetera. 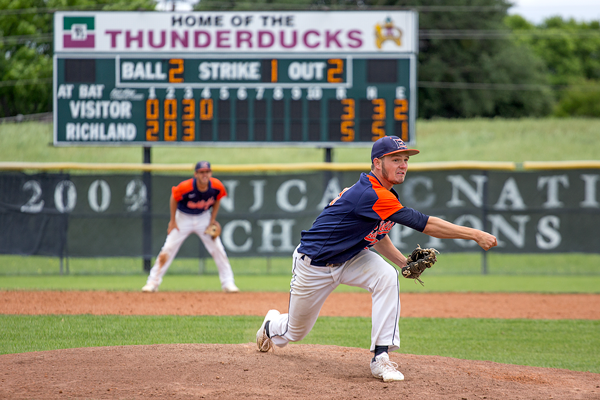 The Eastfield Harvesters baseball team is heading to tournament with an overall record of 25-22 and a conference record of 15-12. The Harvesters have held near the middle of the Region V conference rankings this season. The team boasts a batting average of .318 and a 6.13 pitching ERA. Eastfield coach Michael Martin said he hasn’t been satisfied with the state of the team this semester. Starting catcher Skylar Black, who leads the team in batting average, .414, and home runs, eight, was sidelined after breaking his right hand versus Cedar Valley. Martin said he hopes to have him back before the regular season ends. Despite the injury, Black said he is confident in his team’s ability to be successful in the tournament. Pitcher Paul Bowman (4-2) said the influx of freshman makes consistent play difficult. Bowman also cited a lack of focus for his team and his own struggle on the mound with a 4.97 ERA, but he is confident in his team’s ability to play against anyone. The team expects to face the Tyler Junior College Apaches, ranked sixth nationally, this year after losing the ticket to the national tournament to them for the past two years. Martin is eager to play them. Martin said the team needs to find consistency in their play and recover from the injuries suffered in the season before they can find success in the tournament.